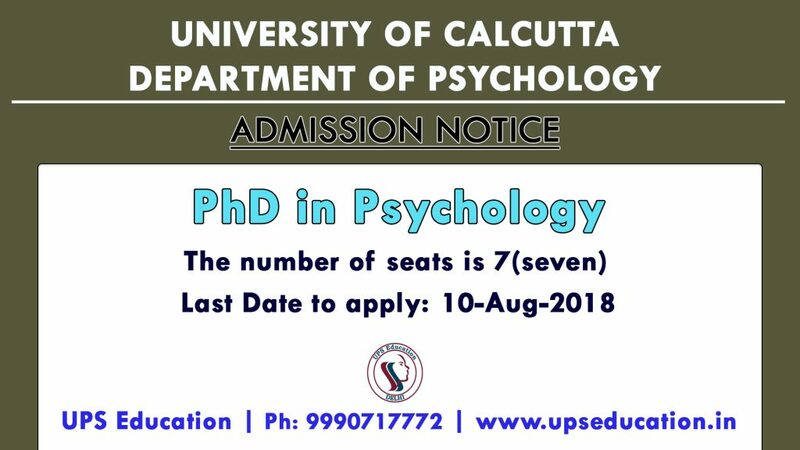 University of Calcutta Department of Psychology invited the application form for admission to the PhD in Psychology. The number of seats is 7(seven). Duly filled application form with one passport sized photograph, attested photocopies of all the credentials and the receipt of the Challan should reach the office of the Department of Psychology within 10.08.2018. This entry was posted in Admission, approaches of psychology, psychology and tagged admission to phd psychology, PhD Psychology admission on August 4, 2018 by UPS Education. 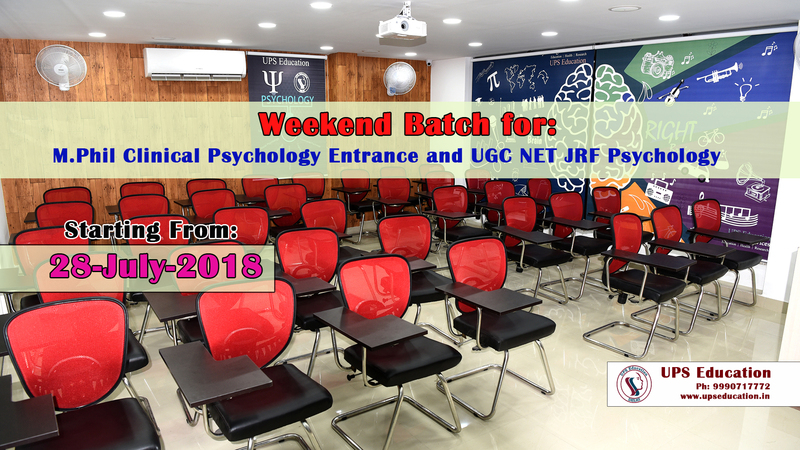 Dear Psychology Aspirants, We are going to Start weekend Batch for M.Phil Clinical Psychology Entrance -2019 and UGC NET JRF Psychology, Batch will starts from 28-July-2018 and, Registrations are open for this batch and you may register till 25-July-2018. Join India’s Best Psychology Coaching institute and enhance your chance of success. This entry was posted in Admission, Best CBSE NET Psychology Best CBSE NET Psychology, Best NET Psychology Coaching, Best NET Psychology Coaching in Delhi, best psychology coaching classes in delhi, m phil clinical psychology coaching, M. Phil Clinical Psychology Coaching, NET JRF Psychology, NET JRF Psychology Coaching, NET Psychology, NET Psychology Coaching, NET Psychology Coaching in Delhi, Tips for NET Psychology Exam, UGC NET Psychology, UGC NET Psychology Coaching, एम फिल क्लिनिकल साइकोलॉजी, एम फिल नैदानिक मनोविज्ञान and tagged Best NET Psychology Coaching in Delhi, m.phil clinical psychology coaching, NET Psychology Coaching on July 16, 2018 by UPS Education. It’s time to accelerate your preparation, boost your preparation join UPS Education today. UPS Education is India’s No.1 Psychology Entrance coaching institute. This entry was posted in Admission and tagged Admission in m.phil clinical psychology entrance 2018, ihbas m.phil clinical psychology admission 2018 on May 11, 2018 by UPS Education. Dear M.Phil Clinical Psychology Aspirant, IHBAS is one of the Best Govt. Institute in India for M.Phil Clinical Psychology course. 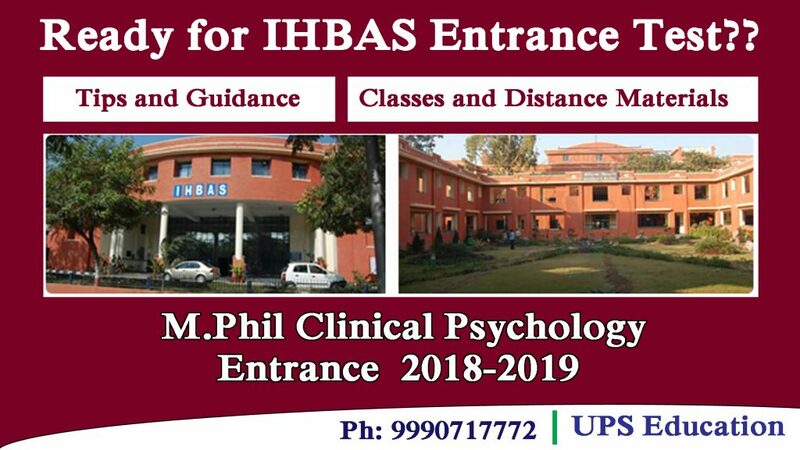 Many students want to take admission in IHBAS for their M.Phil Clinical Psychology. 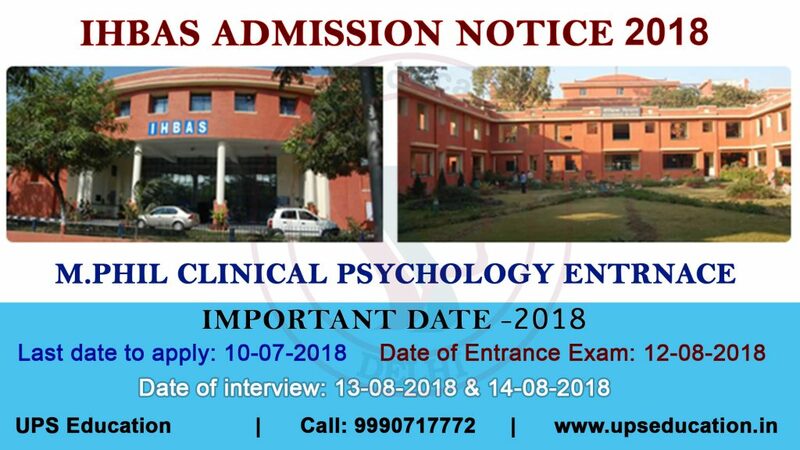 Applications form for M.Phil Clinical Psychology Entrance 2018 will out in month of June. It is the right time to start your preparation for IHBAS M.Phil Entrance, systematic approach of study may help you in your Entrance Exam. For any guidance and help, contact India’s No.1 Psychology Coaching Institute (UPS Education). Our experts and Gold Medalist faculty always ready to clear your queries for IHBAS M.Phil Clinical Psychology Entrance. 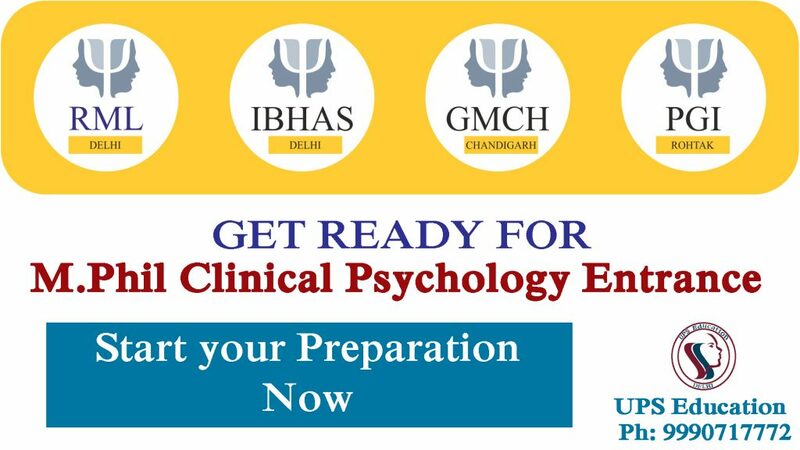 This entry was posted in Admission, एम फिल क्लिनिकल साइकोलॉजी, एम फिल नैदानिक मनोविज्ञान and tagged how to prepare for m.phil clinical psychology entrance, IHBAS M.Phil Clinical Psychology Entrance on April 20, 2018 by UPS Education. 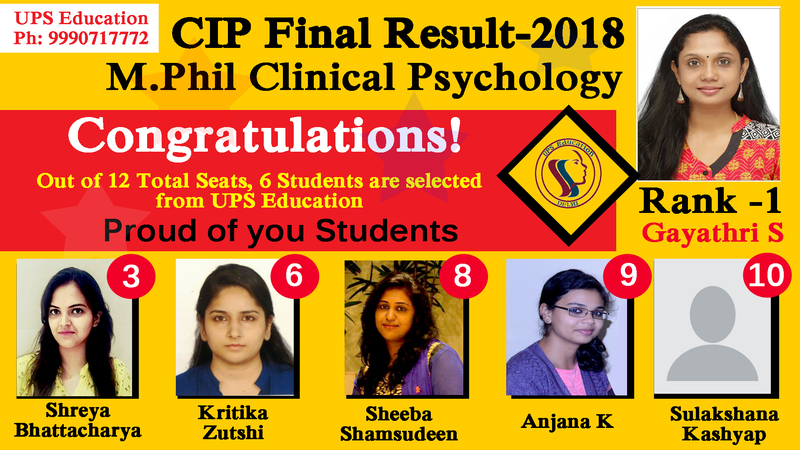 Congratulations to All 6 students of UPS Education, for their selection in CIP Ranchi, M.Phil Clinical Psychology Course 2018-19. We are very glad to inform that, 50% students are selected in CIP are from UPS Education. Total seats are 12 and Six students have been selected from only UPS Education. This entry was posted in Admission, एम फिल क्लिनिकल साइकोलॉजी, एम फिल नैदानिक मनोविज्ञान and tagged CIP M.Phil result 2018, M.Phil Clinical Psychology Entrance result on April 14, 2018 by UPS Education. 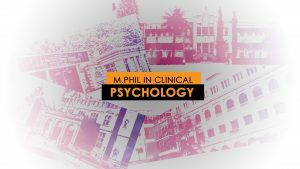 Dear M.Phil Clinical Psychology Aspirants, it is time to accelerate your preparation for M.Phil Clinical Psychology Entrance 2018. Because this 3 months (April – June) is months of Entrances, Entrance examination for M.Phil Clinical Psychology of well-known Universities/Institutes like (RML, IHBAS, GMCH Chandigarh and PGI Rohtak) are usually held in April to June. Therefore, it is time to study smartly. Do Practice from mock tests as many as you can do. Contact with experts and follow their suggestions. It will defiantly increase your chance. Contact us for any information or help for M.Phil Clinical Psychology Entrance. This entry was posted in Admission, mphil clinical psychology entrance, एम फिल क्लिनिकल साइकोलॉजी, एम फिल नैदानिक मनोविज्ञान and tagged gmch Chandigarh, pgi rohtak m.phil clinical psychology entrance, rml m.phil clinical psychology on April 5, 2018 by UPS Education. Dear Psychology Aspirants, Most Psychology students want to do their PhD in Clinical Psychology, as we all know PhD in Clinical Psychology is a course which accredited by Rehabilitation Council of India (RCI). However, students are not aware about the Colleges | University | Institute who provides PhD in Clinical Psychology Course in India. 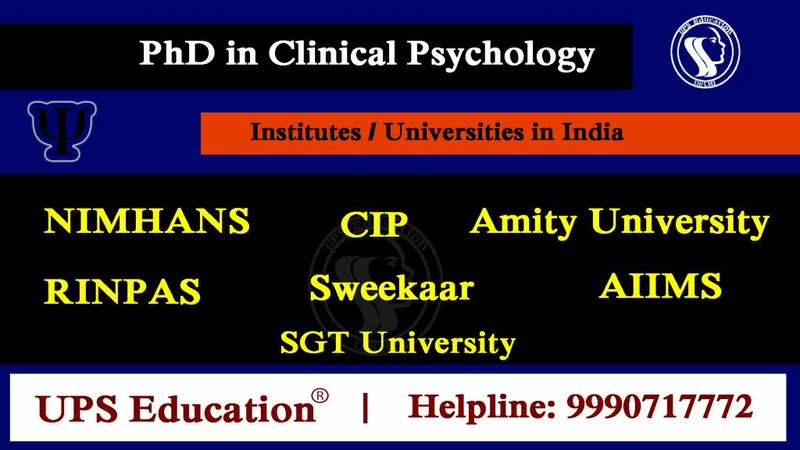 Now you do not worry about this, in this article we listed few universities or institutes who offer PhD Clinical Psychology Course in India. Contact us for any details or information about Clinical Psychology. Visit our website for regular updates. Contact details are given below. This entry was posted in Admission, psychology, PsyD and tagged phd clinical psychology colleges in india, phd clinical psychology course on March 30, 2018 by UPS Education. 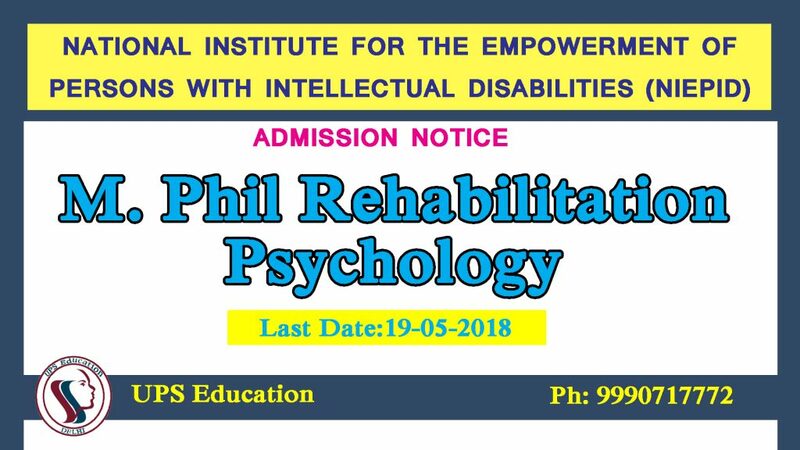 Applications are invited for admission to M. Phil Rehabilitation Psychology course in NATIONAL INSTITUTE FOR THE EMPOWERMENT OF PERSONS WITH INTELLECTUAL DISABILITIES (NIEPID). Further details are given below; fill the application forms as soon as possible. Contact us if you want any help and guidance for your M.Phil Clinical/Rehabilitation Psychology Entrance. Application forms are also out in few other universities click on the following link for latest updates regarding Psychology Entrance Examinations. This entry was posted in Admission, mphil clinical psychology entrance, एम फिल क्लिनिकल साइकोलॉजी, एम फिल नैदानिक मनोविज्ञान and tagged Admission in M. Phil Rehabilitation Psychology, M. Phil Rehabilitation Psychology on March 27, 2018 by UPS Education. 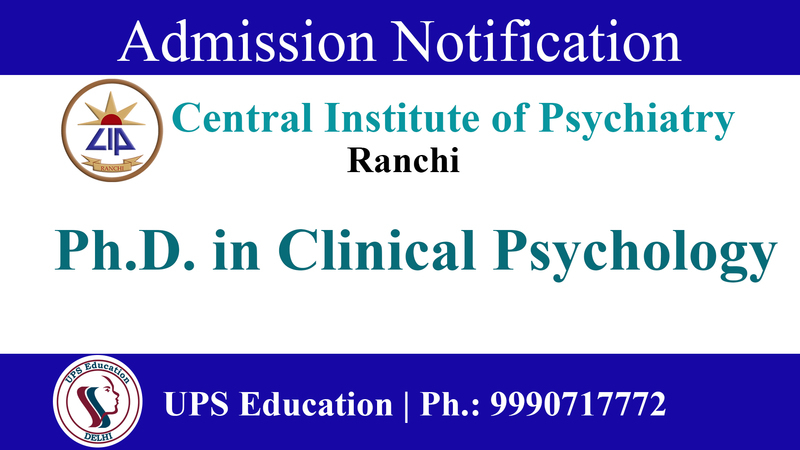 Central Institute of Psychiatry (CIP) invites online applications for admission in Ph.D. in Clinical Psychology (PsyD) for the academic session 2018-19. Please fill the application form before the last day. Qualifications: M.Phil in Medical & Social Psychology/ M.Phil in Clinical Psychology from any recognized University. Do not miss this opportunity to take admission in CIP for your Ph.D in Clinical Psychology course this year, Accelerate your preparation contact UPS Education for any guidance and help for your entrance examination. UPS Education is India’s Leading Institute for Psychology Entrance Exams Coaching Classes and as well as for Distance Learning Mode Coaching. This entry was posted in Admission, PsyD and tagged CIP Psychology Admission 2018, Ph.D. in Clinical Psychology Admission, Psychology phd admission on February 21, 2018 by UPS Education.